BUFFALO, N.Y. -- We've got a new ballpark 'guarantee' for you… you are going to love our next Honda fridaynightbash! 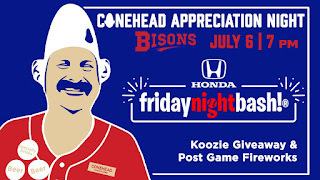 Join us on Friday, July 6 at Coca-Cola Field as we celebrate 'Conehead Appreciation Night' as the Bisons take on the Syracuse Chiefs at 7:05 p.m. 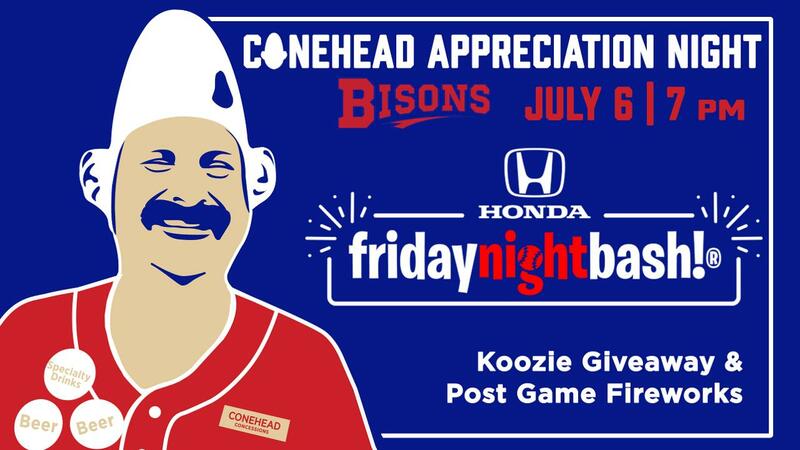 The 2018 season is 'The Cone's' 40th year slinging suds to Bisons fans, so join us as pay tribute to one of the true ambassadors of the Bisons' ballpark experience. Along with pre-game ceremonies honoring Tom 'The Conehead' Girot, well will also give out a Reversible Conehead Koozie to the first 2,000 fans through the Inspire Dental Gate at Swan St. when it opens at 5:00 p.m. for the Resurgence Brewing Happy Hour. Plus, every 40th beer sold by any of the ballpark vendors on Friday will be FREE!!! This is also a great opportunity to get yourself the all-new 'Conehead IPA,' a Buffalo Style IPA that is only available at the ballpark! The night begins with the Resurgence Brewing Happy Hour at 5:00 p.m., featuring 14 oz. craft beers for only $3.00 until 6:30 p.m. There are also great $3 food specials on the Original Pizza Logs, Charlie the Butcher Beef on Weck and BW's Barbeque Pulled Pork sandwiches. And of course, now Honda fridaynightbash! is complete without an amazing postgame Fireworks Show! CLICK HERE for tickets and more informatin on thoe Bisons' Honda fridaynightbash! series.